The Metal X greatly accelerates innovation, delivering metal parts overnight using a new technology at a fraction of the cost. Leave 20th century manufacturing in the dust and create anything from industrial replacement parts to injection molds to working prototypes. Industrial grade performance starts with an all-aluminum unibody enclosure built around an ultra flat gantry system. Add a machined aluminum stage with kinematic bed coupling, and a precision ground print platform. Then close the loop with software - instrumenting each machine with a full sensor suite including motor encoders and a calibration laser so accurate it can compensate for single digit changes in room temperature. Featuring the unique dual nozzle print system, the X5 unlocks the ability to weave a strand of Continuous Fiberglass throughout a part to make it as strong as metal. Add that to the all-aluminum unibody enclosure, ultra-flat gantry system, machined aluminum stage with kinematic bed coupling, motor encoders and calibration laser, and tie it all together with software. The Mark Two combines Markforged's unique continuous carbon fiber reinforcement with workhorse reliability for the strongest, most versatile parts in our portfolio. It is the only printer in the industry that enables you to go from CAD to beautiful, end-use strong parts in hours. With your choice of reinforcement and plastics, remove the time, hassle and design iterations and put your parts to use right off the printer engineered with the right material for any job. 3D printing is evolving into a serious engineering and manufacturing tool. 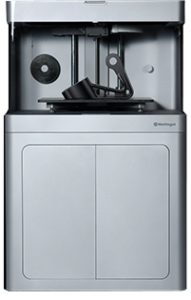 The Onyx Series 3D Printers are designed to be every engineer and designer's first printer, fulfilling the Markforged mission of strong, beautiful carbon fiber parts everywhere. Each component – the hardware, software, and materials - combine to deliver the first accessible 3D printing experience on the market that everyone will love to use.